Size M – Chest Girth adjustable from 16″-25″.Please measure your pet before you purchasing. Waterproof fabric with high strength, mesh lining with soft sponge padding. Nylon webbing with the reflective material ensure good visibility at night on the road. Lightweight plastic buckle with large loading capacity, it ensures easy to fit and put on/take off. Great for walking, running, hiking and other outdoor activities, fit for medium or large dogs. PUPTECK Soft Mesh Dog Harness Reflective Pet Puppy Padded Vest Harnesses. Our Harness provides greater support to your dog than a collar. This is the stylish, safe, and durable dog harness you have been waiting for! DESIGN: It’s made of waterproof material with soft mesh lining. Great for outdoor sports. It supports your dog during walking, standing or climbing stairs. 3M Reflective Line, ensure the dog’s safety in night on the road. Lightweight plastic buckle is easy to fit and put on/take off. Thickening nylon ribbon can bear strong pulling for and not break. Best protection to pet’s delicate chest, which prevents the damage from thin straps. MEASUREMENT: Please do not purchase the harness based on the size of another manufacturer/designer. You have to take various measurements into consideration before you purchase this harness. All dogs are built differently and some dogs have very deep or broad chest, whereas some dogs have a large head compared to their body. So please make sure you measure correctly and make sure your dog’s head can clear the neck opening of the harness, as this portion is fixed in size and CANNOT be adjusted or snapped on. 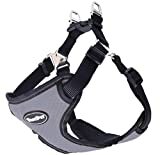 This entry was posted in Dogs and tagged Adjustable, Freedom, Gray, Harness, Medium, Pull, Puppy, PUPTECK, Reflective, Walking by One Boutique. Bookmark the permalink.